We’re weeks past the Vernal Equinox, but it’s only in the last few days that I’ve been convinced that spring truly has arrived. I’ve learned not to trust calendar dates or average frost dates. Instead, I wait for certain signs from nature and not just one bloom or one particular plant. Mother Nature tricks plants as easily as people. I look instead for a series of signs, a compilation of evidence that it’s time for me to trust in the season’s change and to climb out of my cave and enjoy the sunshine. 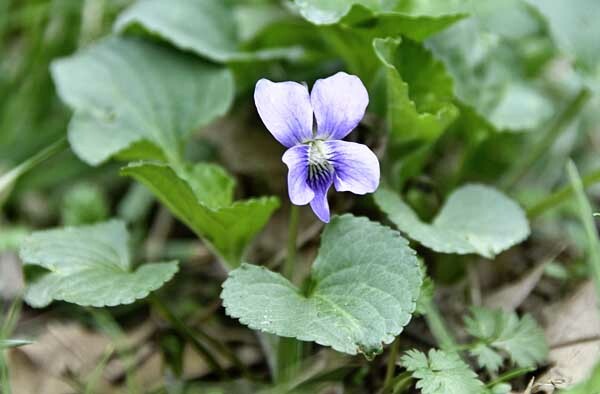 Yesterday’s sunshine found the violets near the creek in bloom. The more delicate violas bloomed in the clearing beyond, but those photos didn’t turn out well. 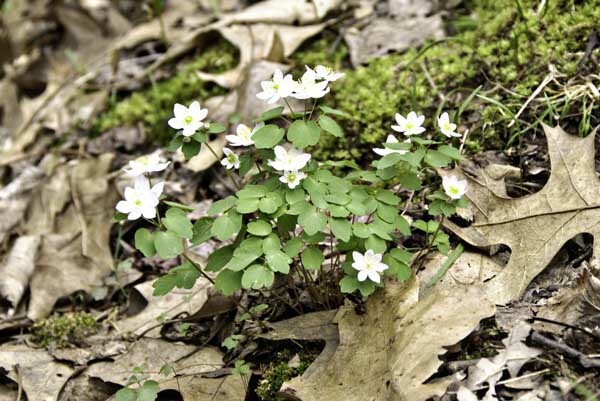 Clusters of rue anemone add a touch of beauty to the forest floor along the creek. I frequently misidentify these anemones as another woodland flower, Spring Beauty, and must stop to think which is which, then check one of the wildflower guides just to be sure. That’s the trouble with having learned so many common names as a child from various family elders. Sometimes the elders get it wrong. Other times the child confuses the plants, and the faulty identification sticks in the brain with the persistence of a cockleburr. 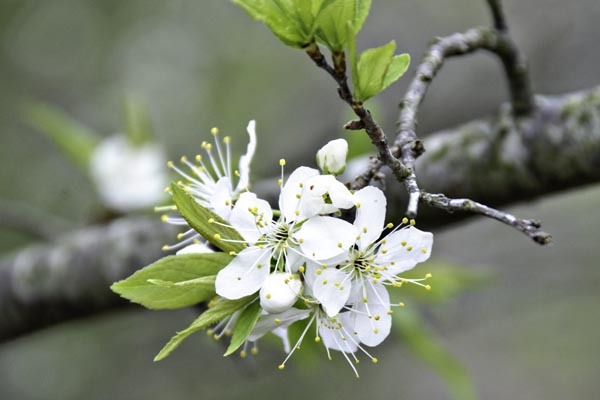 Thickets of wild plums bloom here and there. 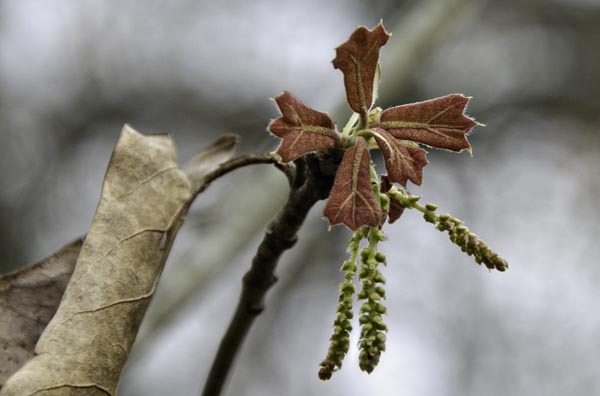 The oak leaves have escaped their buds, and soon the pollen will spill forth, too. 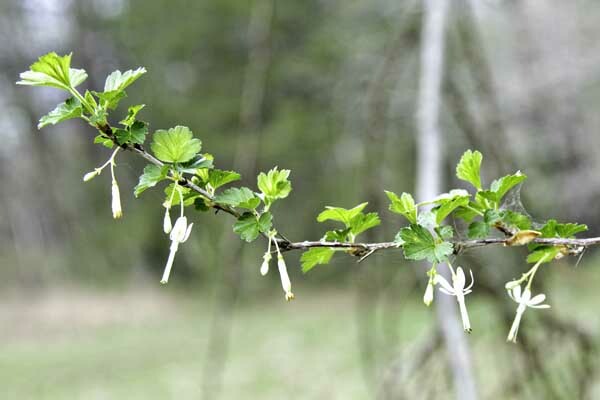 Even the gooseberry bushes are blooming. Not wild but a delight nonetheless, my precious pink dogwood is just beginning to unfurl its petals. 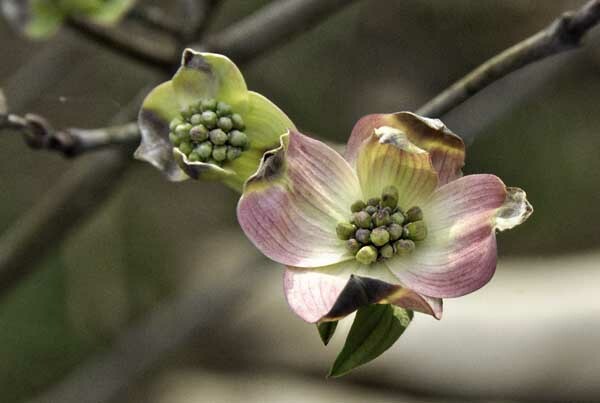 The pink dogwood isn’t native to this area, but it’s a species I’m particularly attached to for sentimental reasons. My grandparents had a mature, well-shaped pink dogwood not far from the kitchen window, and it exploded into generous, glorious bloom each spring. Much as I love each progressive sign of the season, every green leaf and tender bloom, spring isn’t spring until I’ve touched a dogwood blossom. Yeah, I like the progression too, but sometimes I wish a few of the flowers would stick around longer. Shhh… you said the “P” word…. so far my hayfever hasn’t kicked in, I was hoping it wouldn’t know it was spring.